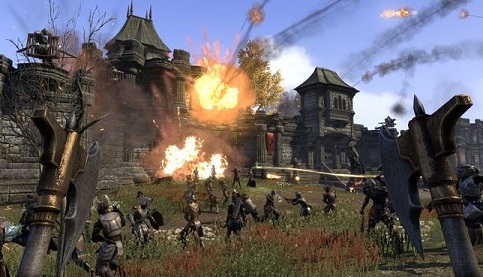 The alliance of Bretons, orcs and Redguard, came into existence deep in the west of Tamriel. The purpose of this rather Democratic Group is to establish a stable government and rebuild the Second Empire. The Great King Emeric is responsible for the unification of the three nations to fall Dagger Alliance and ruled them out of Wayrest in High Rock. The alliance is struggling with the Aldmeri Dominion and the legacy Heart Covenant on the rule of Robin throne. In addition, the lion is the symbol of the alliance. The Bretons may be selected from any class. However, they specialize in the magic. They quickly learn how to deal with light armor and have increased Magicka values. They also reduce costs for spells and increase its magic resistance. The breed of the Bretons is thus suitable for the classic version of the Wizard. The orcs specialize in strength and endurance, which is why they are more robust than the Bretons. They also have increased stamina and life. They also regenerate hit points faster and learn early how to deal with heavy armor. Especially for Drachenritter and night blades, the orc has the right skills. The breed of talents Redguards focus on protection and endurance. They also are particularly suitable for classes Templars and Dragon Knights. Your stamina regeneration is improved and increased the maximum amount of stamina. To the south of Tamriel pull two Elves peoples together with the feline creatures in the war. The Wood Elves and High Elves, have united with the Khajiit to spread their Ideilogie. Who opposes the Dominion or does not belong to the alliance, is regarded as merciless enemy. The Almeri-Dominion is represented by the sign of the eagle. The Wood Elves are immune to most diseases and poisons. In addition, they are excellent archers. Thanks to their race talent, they have a high endurance regeneration and improved stealth capabilities. Therefore, they are particularly well suited as night blades, as they attack the enemy from a distance or approach him almost invisible. The High Elves are born magician. They have experience working with wands and increased Magicka regeneration. In addition, the value of the maximum magicka is substantially higher than in other breeds. In addition, they have fire, ice and lightning attacks. Especially with the passive racial abilities that have Khajiit many advantages over other races. They quickly learn how to use medium armor, have improved creep and hit-and can own life regeneration rate increase again. From these advantages, the feline essence, mainly benefits the class of Nightblade. The north and east of Tamriel, is the realm of Ebonheart Pact. This consists of Dark Elves, North and Argonians. These three nations were brought together only by the Akaviri invasion because between North and dark elves there were many wars in the past and the lizards adhere Argonians previously enslaved for decades by the Dark Elves. The Ebonheart Pact is represent by the dragon symbol. The Dark Elves are proficient with two-handed weapons. They can also increase their endurance and Magicka value. Additional specialty heard the fire. With the right talent, they protect themselves from fire damage while increasing their strength with fire effects. Therefore, the dark elf is good for magician with fire bars or night blades and Dragon Knights. The lizard-like Argonians , are the best healers in all of Tamriel. They quickly learn how to use recovery rods and potions have with them an improved effect. They also strengthen their healing spells and are the best swimmers in the country. When class is suitable Templar. The North are merciless fighters. Therefore, they have advantages in dealing with two-handed weapons, and in the regeneration of their own life energy. They also have an increased life energy and resistance to frost and cold damage. Armor they wear also more efficient than other races in Tamriel. They are thus particularly suitable as Dragon Knight.